The hearts of the entire NASA family go out to our friends, family, colleagues and countrymen and women in South Carolina. While the people of my home state have seen our share of tough times (including severe weather events), I cannot recall, in all my years growing up in the Palmetto State, rains and flooding as devastating as what has been going on this week. As a child of Columbia, I can personally attest to the fact that South Carolinians are resilient. As the people of the Palmetto State turn to the tough task of recovery and rebuilding, we hope that they will know that NASA is with them every step of the way – and we have been since the storm began. From the time the rain began to fall, our assets in space were watching it and our scientists were harnessing these unique capabilities day after day for weather forecasters and the emergency agencies dealing with the flooding and other impacts of the storm. NASA provided regular updates on the amount of rain falling across the region using data from the Global Precipitation Measurement (GPM) mission. Data from the GPM Core Observatory that we launched with the Japan Aerospace Exploration Agency (JAXA) last year is combined with rainfall estimates from a constellation of international satellites to provide rainfall totals every three hours. These data not only confirmed the record-breaking rainfall totals in the Carolinas, they helped forecast the extent of flooding in the region. 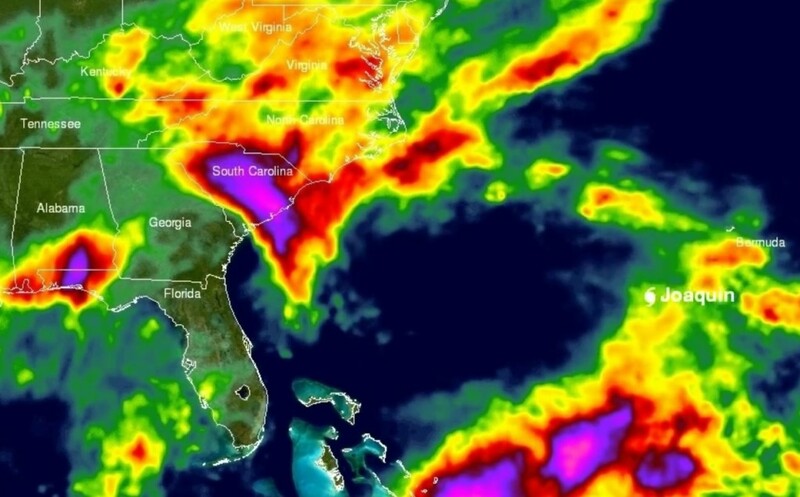 Rainfall totals over the U.S. Southeast measured from space by the NASA/JAXA Global Precipitation Measurement mission aided weather forecasters and emergency agencies responding to extensive flooding in South Carolina. NASA provided the National Weather Service with detailed information about how water-saturated the ground was across the U.S. Southeast from the heavy rains – a key factor in forecasting flood conditions. Data from GPM and another NASA satellite, the Soil Moisture Active Passive (SMAP) mission, were combined in the NASA Land Information System model to produce experimental soil moisture estimates as a new piece of information for short-term flood forecasting. Maps of the location and severity of local flooding produced by a NASA-funded experimental modeling system at the University of Maryland were provided to Federal Emergency Management Agency (FEMA) to help identify hard hit areas across South Carolina. The system, fine-tuned with over a decade of previous NASA satellite precipitation data, used GPM data to estimate the intensity and location of floods every three hours. It will be a while before South Carolina recovers from the enormous rainfall and flooding. The loss of life and property is a heartbreaking outcome of this disaster that will take more than time to heal. I want everyone in South Carolina and other parts of the world threatened by natural disasters to know that NASA is dedicated to using our scientific ingenuity and innovative satellite resources to help inform response and recovery efforts on the ground. There are some who have suggested our country and our agency ought be doing less when it comes to Earth Science. When tragedies like these occur, I believe it’s a reminder that we ought be doing more. As we make advances in studying Earth’s climate, weather, oceans, ice caps, and land cover, that long-term effort of scientific discovery also yields benefits in improving our ability to respond to and recover from natural disasters. Today, Americans everywhere are thinking about our brothers and sisters in South Carolina. We know that the Palmetto State will recover stronger, just like we always have.